If you thought the first four cubs, born to Shera, were awesome, wait until you meet their half-siblings, born to Nababiep today. 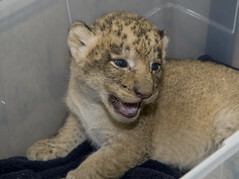 There are three of the little ones in Nababiep’s den now, and the Zoo thinks it’s possible that there will be additional cubs born today, as lions can frequently spread out multiple births across hours. The first three cubs were born starting just after 8:00am this morning. The father, Luke, was seen preening and accepting high-fives from the other nearby great cats and smoking a cigar. He will worry about sending them to Lion college once the “Dad high” wears off later today. Great cat high fives are some of the best high fives. Great news and I wish all of the little ones (AND their parents) long, happy lives. I wish all of the cubs well and their parents too, I know it must be hard living in captivity forever but these have certainly adapted well! CUDOS to the zoo and their staff for making them comfortable and i’ll be waiting to hear if she has any more up her sleeve making their arrival today!